Are you in love with chai as much as we are? Why just stop at the drink? 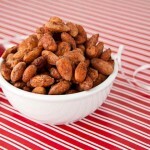 Make these tasty roasted nuts that are soaked overnight to soften the affects on your digestion. Your tummy and taste buds will be smiling with joy! Combine all spice mix ingredients in an air-tight container. Shake and use as a replacement for cinnamon and other spices in your favorite baked goods… including this almond recipe! Preheat the oven to 300F. Line a baking sheet with a silicon mat or parchment paper and set aside. If soaking the nuts, drain and rinse and allow to drip dry in a colander. In a mixing bowl, whisk the egg white and vanilla extract until frothy, about 30 seconds. Add the almonds to the whisked egg mixture and stir to evenly coat all of the almonds. Add the coconut sugar, chai spice mix and a pinch of salt. Toss until all of the almonds are covered. Spread out on the prepared baking sheet and bake for 30-35 minutes, rotating twice. 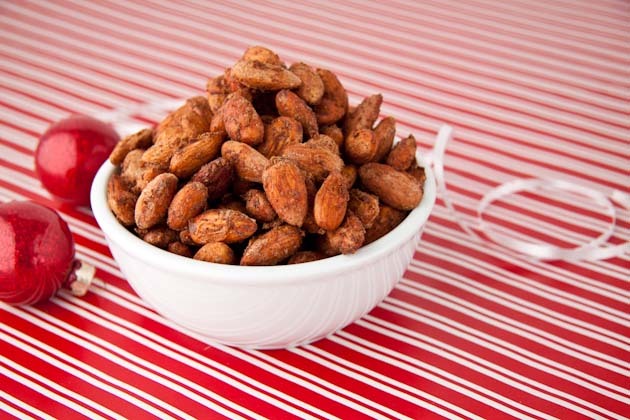 Remove from the oven and spread the almonds out on waxed paper or parchment paper to cool completely. Store in an airtight container. Soaking the nuts is completely optional. I did it so that they were easier to digest. They will get sticky after a couple of days in the fridge just because they have more moisture than a dry nut would. They’re just as good sticky, but may not be your preference. To make vegan, replace egg whites with 1 tablespoon liquid sweetener like maple syrup, or 1 tablespoon apple sauce.